Yesterday I was in the middle of writing my post with this yummy Gluten Free Cherry Chocolate Muffin recipe, provided by my wonderful sister, when the power went out. And not just that. We were watching the soccer game Peru against Chile and poofffff everything dark. It took 1.5 hours for the power to come back. Earlier we had a bad thunderstorm with very high winds and a branch damaged the power lines. 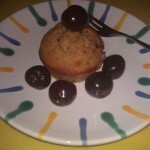 But now everything is fine and I was able to upload this yummy Cherry Chocolate Muffin recipe which my sister made. With many thanks to Ms Galenorn, we adapted that recipe to our recipe with addition of different ingredients. But I always come back to her basic recipe because it is so versatile. 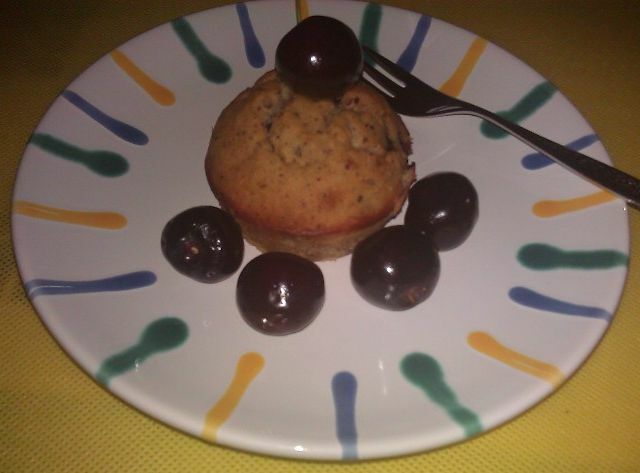 So, here is our Cherry Chocolate Muffin recipe. Enjoy! Corn, that looks so good. I like new flavors, like yolersuf. Not sure if you like cilantro; but here’s my twist on soft taco. Try it and tell me what you think. Whole wheat soft taco shells. Chicken breast cut into strips or ground. Marinate your diced jalapeno(deseeded), bell peppers, red onions, tomatos and cilantro in lime juice. Saute chicken strips or brown ground chicken, add desired taco seasoning, then add your corn and black beans. Assemble my fiesta taco and enjoy! Hope you like it! Thank you for this recipe, but I stay away from corn. Besides being considered a grain, if it also GMO, so that is a no no for me. I do not use any wheat – whole or not – so those tacos have to be made with something else. I’ll try to adjust your recipe and see what develops.